Automatic pet feeders can be one of the most helpful things that you add to your home, especially if you have experience trying to get your cats on a schedule. Cats can be extremely temperamental and, at the end of the day, anything that makes the task easier can be a fantastic thing. The topPets automatic pet feeder is by and large one of the better options you’ll come across, so we’ll take a good look at it to be sure. We’ll touch on a few highlights about this automatic pet feeder, although there is plenty more to be impressed with. Cats can be some of the most stubborn animals on the planet when you start putting them on a feeding schedule. They want to have food available to them whenever they like, not when their vet says it’s ok. With that in mind, it is vital that you be able to keep your pets out of the hopper. 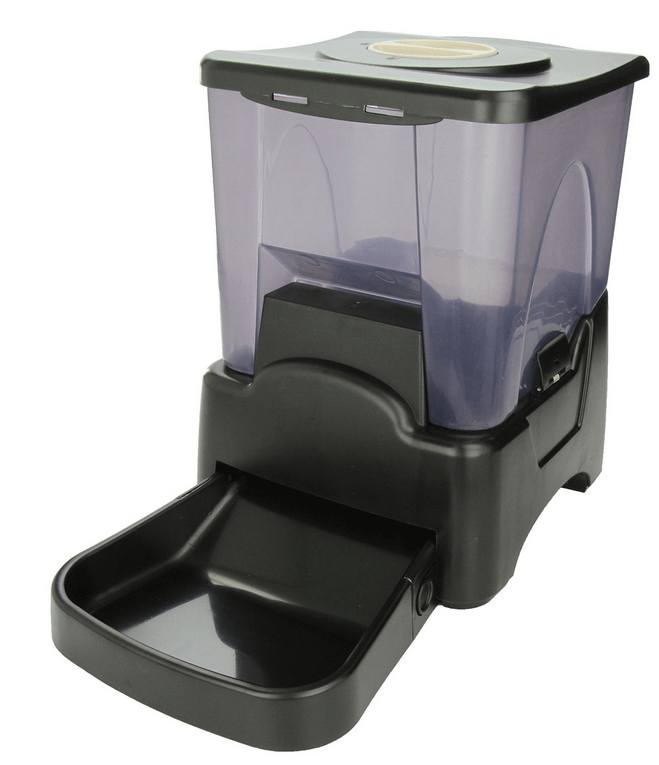 This automatic feeder was constructed with a pet proof lock and a very heavy base, which work together to keep pets out of the top of the hopper as well as preventing them from tipping over the feeder and spilling the food. This feeder lets you easily program food portions ahead of time, even up to 99 days in advance. There is also the ability to feed your cat as small of portions as 1/4 cup or up to 2 1/2 cups if you have a particularly large cat, a cat that requires a single feeding a day, or multiple cats that need to be fed. 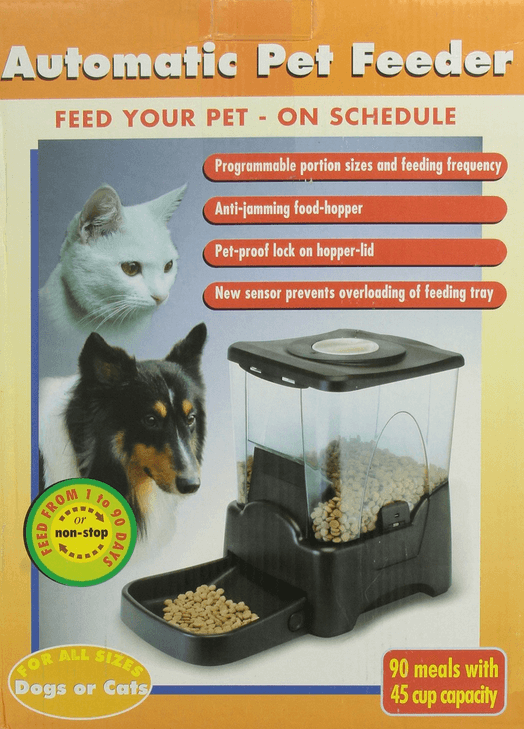 This automatic pet feeder is meant to hold much more food than many of the others on the market. When you are using an automatic feeder, it can defeat the purpose when you have to refill it on a regular basis. This feeder, on the other hand, holds up to 45 cups of food, which is enough for three months in some cases. You won’t have to ever worry about your cat running out of food for your cat. Cats love hearing their owner’s voice, even if they don’t seem like it at the time. That is why they have included the ability to record a special message for your cat each time they have a feeding ready. If you aren’t interested in that, though, you can set it to ding an alarm each time it is preparing to drop food into the bowl. Cats aren’t always cheap to take care of, but it is possible to feed your cats on a schedule without spending the last of your paycheck. 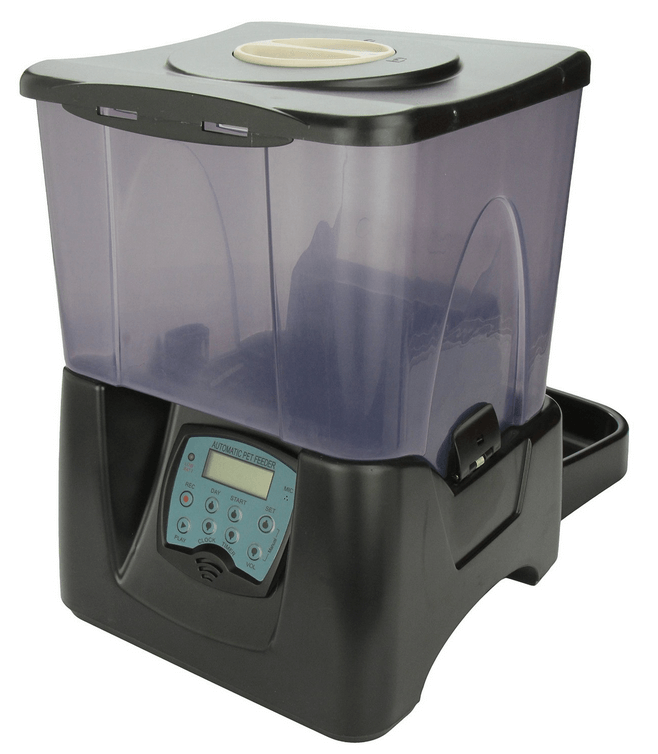 This topPets automatic feeder is only around $50, which is far less than the $200 price tag that a lot of other automatic feeders carry. That doesn’t mean that has sacrificed to get there, which is important when you want something that is going to stand the test of time. Some people have a problem with feeders that don’t have an AC adapter. This means that you will be forced to rely on only battery power, but fortunately it can last for several months on that power source. There is no need to worry about whether or not you are going to have to replace the batteries with this automatic feeder. The hopper is 10” X 10”X15” and the feeder makes it 17” deep when attached. It takes up more room than a regular cat bowl, but that is because it takes the place of a feeding bowl as well as a food container. The bowl is made out of plastic that can be easily washed and cleaned. This feeder can be used outside, but ants might be able to find a way into the bowl if you aren’t careful. There is no special feature that will keep insects out of the feeder. The hopper can hold around 12 pounds worth of food. Depending on how much your cats eat, you can fill it once and last for over a month. This pet feeder can feed multiple cats, but it will largely depend on the personalities of the cats that you have. Many cats aren’t ok with being fed at the same time. 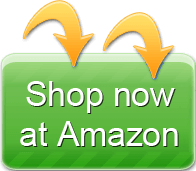 While one of the cheaper automatic feeders on the market today, it is also one of the best. There are some people that have concerns about the quality, but as you can see here it is one that certainly has a lot to offer cat owners. The easy scheduling and pet-proof lock make it something that will help keep your cats on a schedule without any of the headache that usually comes with it. I had this one for a while and it works, but it is certainly a noisy feeder and shy cats will get away from it. Also, it doesn’t measure kibble amounts with enough precision, it will toss too much of it when the hopper is full. On the pros, it is one of the cheapest automatic feeders, so if you cat is not scared of it it can work well for an emergency.